The WHW race clan has one queen that rules the roost of all drama. Mark Hamilton alias Drama Queen. But over the last few months there has been many a drama princess fighting for the top position of queen bee. But who else would complete a 95 mile trail race, after fracturing their ankle within the first five miles? Mark we all bow to your superior queenliness. 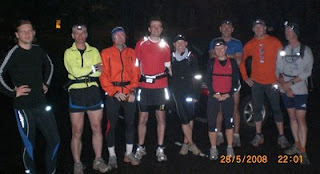 I have read and heard about various ailments that have threatened many participants finishing (and starting ability!). There's been bums falling off, sprains, tears, falls, tendinitis, fatigue, man-flu and cantbebotheredtraining-itus. There's been bonking, chaffing, burning, bruising and blisters. We've covered every bodily pain from glutes, hamstrings, ankles, knees, quads, calves all the way up to shoulders and neck. Apart the usual I-pushed-myself-too-far aches and pains, I have remained to stay relatively injury free. That is until last night. Yes, three weeks before the race. My foot feels like it's cracked down the middle. How's that for drama? Mark, do you need an apprentice? To cast your mind back, Saturday's devils route was the best run of the year. And then on Monday I went for a brisked walk on the WHW. After a few hours I noticed a sharp pain down the front of my foot. I put it down to overuse or having my laces too tight, so didn't think too much of it. 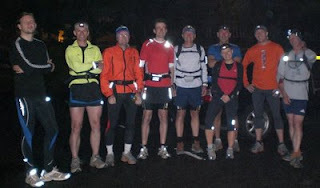 Last night I organised a WHW training group run...in the dark! 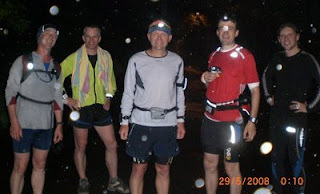 Apart from my brief stints on the back-roads of Alexandria during the winter, I had very limited experience of running in poor lighting. I felt great when I started. A few days rest always does the world of good. 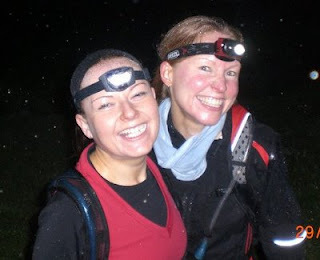 Sharon and I - for some reason unbeknown to us - ended up at the front of the pack. 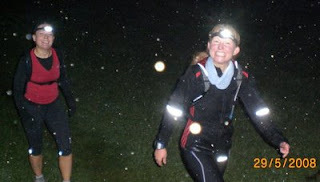 We made our excuses, because nature called, and dropped back leaving the boys to head off in the dark and mist. After about two miles my foot ached and by the time I hit the road into Drymen I was swearing like a drunken sailor. Ideally I should have pulled out, but when you're stuck mid-route in the dark and pouring rain, the only option is to push on. It's the bone on the mid-front of my foot. Any advice anyone? Anything? I'll try anything. We finished in 2:15, which is nothing to be snuffed at. That would be a perfect time for race day. I just need to sort out the foot situation. After driving home, I could barely walk to the house. And today I'm walking like I've got a club foot. Not pretty. I'm trying not to panic about it, so I'm focusing on staying positive. I've got a great Devils run under my belt. And injury is just your body's way of saying you need a rest. Right? Sonic and I were planning on running from Drymen to Beinglas on Saturday, but that's been shelved until further notice. I'll be dusting down my bike for the weekend. Looks like it's going to be perfect conditions for cycling. Although I did have my camera last night, my thoughts were elsewhere. I've nicked these pictures from John's blog. Hope you don't mind JK? So sorry to hear about your foot. I really hope it clears up soon. You have done all the hard work and so if you can't do much between now and the race you'll be fine. Regarding the photos ... no problem ... take as many as you like! I'd basically stop putting load on your foot as much as possible for a week and see a physio asap. If you have bruised the ball of your foot it'll probably be OK in a week or so with regular icing (I have done this before), but if there is muscle or tendon damage you'll need the scar tissue worked out. Sorry to hear of your injury, Debs. I'm afraid I can't offer any advice beyond what Brian already has. however, one of my support crew is a sports masseur and has magic fingers that seem to provide a short term cure for many ailments. He might not fix the problem but he's great at keeping you going. If you need his assistance on race day let me know. Thanks everyone for your comments. And thanks to Ian and Richie emailing me advice and general support. I can't get a physio appointment until Monday, so I'll just behave until then. Dave - a sport masseur on your support team is very handy indeed. But my pal Sara makes great cakes. Debs, try Ibuprofen in case it is an inflammation. Last week I had a similar problem and I could hardly walk. It appeared when I was walking actually not runnning. Now it's gone. Also could be you have a small sharp object in your foot, like a splinter. Could be taper phantom pain as well (honestly). Hopefully you get it sorted soon. You can afford to take it easy now. I'll take the cakes over the massage everytime! Fingers crossed for you Debs. Don't make my mistake. I had a foot injury leading up to the Blackpool marathon a few years back. Being a bit of a novice back then, I kept training and in the end had to pull out of the Marathon on 19 miles in extreme pain. Give it time to recover, you have 3 weeks and all the hard works done! Get Big Billy Consani to have a word with the Rangers Physio I hear he's got connections in Castle Greyskull now:-)on a serious note rest is the best option at this stage, I know it's difficult but all the hard work is done you've nothing to gain now, just get yourself on that start line pain free I'm sure you will. I'm sure the foot will be fine on the day. I agree with Thomas that phantom pain could be a possibility. One year Ian arrived at the start with knee pain so bad he was hobbling. It disappeared when the race started!!! Mmmm, cakes. I'm looking out for your support crew on the day! Hi Debbie, I'm just going to agree with everyone else and say "rest & physio". A bit of icing won't go amiss either. If you're lucky, it's just a bit of tendinitis over the dorsum of your foot and will settle quickly. The unlucky options don't really bear thinking about at this stage so I won't go into them. Good luck! I know what you're going through. BTDTGTTS. Did I forget to mention I'm trained in sports massage? If you did the damage on Wednesday then you need to Rest Ice compress and elevate for about 72 hours.Keep moving it though.Even writing the alphabet with your big toe will help. Then start gently mobilising the injury gradually becoming more weight bearing. I can do massage on it which will help bring it on. E - mail me if you want me to see you. I'm off to Ellon tomorrow with some work but should be back in the evening. I'll check for a message then if I don't hear tonight. Apart from the socks as a potential source, you might also want to consider consulting a podiatrist. We know one (in Gourock though)with a special interest in sports related problems if you need a contact. 11 comments so far? Incredible. I don't even get 11 birthday cards. .. and I should have added that i agree with the consensus view about rest and physio. I'm sure it will be fine. Have got all fingers crossed for your foot, and had better up my game on the cake front and improve from the training weekend performance! (or lack of!) Looking forward to our team debs chat on sunday! Go to my blog for details. I look forward to reading your answers! Hi Debs how are you doing? Your blog is very quiet. How is your foot?